Reading and share top 1 famous quotes and sayings about Intertextuality by famous authors and people. Browse top 1 famous quotes and sayings about Intertextuality by most favorite authors. 1. 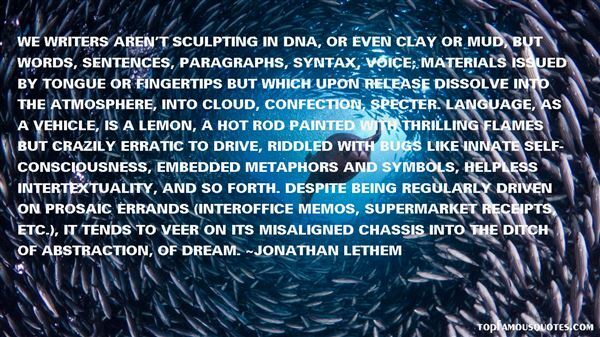 "We writers aren't sculpting in DNA, or even clay or mud, but words, sentences, paragraphs, syntax, voice; materials issued by tongue or fingertips but which upon release dissolve into the atmosphere, into cloud, confection, specter. Language, as a vehicle, is a lemon, a hot rod painted with thrilling flames but crazily erratic to drive, riddled with bugs like innate self-consciousness, embedded metaphors and symbols, helpless intertextuality, and so forth. Despite being regularly driven on prosaic errands (interoffice memos, supermarket receipts, etc. ), it tends to veer on its misaligned chassis into the ditch of abstraction, of dream." The Apple II was not designed like an ordinary product. It used crazy tricks everywhere."